New Look...Same Great Site. 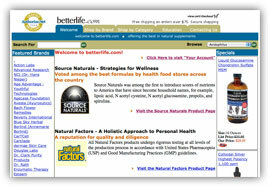 Betterlife.com is proud to unveil its new website, offering enhanced usability and features. It's a brand new look-with the same personalized service you've come to rely on! You may continue to use the original betterlife.com site.